There are lots of places to visit during your stay at Chez les Rois, below are just a few of our favourites. For more information of local attractions, things to do and places to visit www.discover-poitou-charentes.com. Aubeterre considered to be one of the most prettiest villages in France, and it’s easy to see why. Stroll round the village taking in the architecture, visit the shops, make sure you see the monolithic church and then have lunch in the square. Make a day of it.Canoe in the morning, have lunch after the canoe trip at Bonnes and then visit the village in the afternoon. Late afternoon make your way down to the beach to catch the last of the sun. Brantome is the Venise of the Perigord. The river runs round the town and it is very picturesque with riverside restaurants. Make a day of it.If you go to Riberac market on the Friday morning you could pick up some wonderful local produce including roast chickens, salad, melons, strawberries and tarts ….. and not forgetting the wine. Perfect ingredients for a picnic and then travel onto Brantome and picnic by the river. Perhaps take a boat trip and meander through the town visit the cathedral and the shops built into the side of the rock face. Dune de Pila has the highest sand dune in Europe. And although it’s a few hours a way it is without doubt stunning to see. There are steps to walk up it but after you reach the top its just sand, sand and more sand. The view at the top is worth the hike. Make sure you visit Arcachon and its bay and make sure you try the oysters. Bordeaux is a historic city and well worth the visit just for the architecture alone. It has some wonderful shops but for teenagers we would probably recommend the shopping mall at Auchan Commercial Centre near the Lac. If you are spending Christmas or New Year at Chez les Rois you must visit Bordeaux at night to see the Christmas lights and the Christmas village. Local artesians come to sell their goods in log cabins, you can sample 'vin chaud' and roasted chestnuts. There are several groups that come to play music across the road at the Theatre and if you make your way to the quays there is also ice-skating. St Georges de Didonde is on the Atlantic coast and only one hours drive from Chez les Rois. We first discovered St George when our kids we little. It’s a brilliant beach and there is also lots for the kids to do. Teenagers can wind surf, take small boats out and at the end of the beach is an adventure playground where kids can climb and swing through trees. Meschers is just a few minutes down the coast and has the famous troglodyte, caves. There is a museum which shows people living in them a hundred years or so ago and what life was like then. In fact people still live in a few of them today. Talmont is one of my favourite places. A small fishing village with lots of character……small whitewashed cottages, turquoise shutters, cobbled streets lined with hollyhocks. A picture in the making ! Talmont was once one of the dropping off places for the pilgrims making their way to Compostella in Spain. The church there is built on a rocky peninsula that juts out into the Gironde Estuary. Visit the caves in the morning, have lunch at Talmont and then relax on the beach in the afternoon. There are a host of small coves around this area. Royan is a great sea side town and has something for everyone. Visit the zoo in the morning. Be warned it gets very busy in summer. Then see Royan during the afternoon. Il d’ Oleron is reached by a very long viaduct from the mainland. It’s a beautiful place to see. St Pierre is the islands capital with “dinky” shops and lots of fish restaurants. Bouyardville is also worth the visit, you can even take a boat trip to see the famous Fort Bouyard. Il de Ré Il de Ré is where the Parisians holiday. White sand and turquoise waters. St Martin is the capital of the island and has a small harbour with many yachts. Lots of really nice shops here and restaurants but you will need to put the visa card in the freezer when you get back. Pay a visit to the old fort and you will be able to see the Donkeys of Il de Ré with their trousers on! Well, I could spend a day in La Rochelle, a day on the Il d’Oleron and another day on the Il de Ré but if you are trying to do something for every age group then head for Il d’ Oleron. Blaye on the Gironde Estuary is quite an interesting place. Its an old citadel dating back to Roman times. It has a lively Saturday morning market and then after you could have lunch in the citadel and then walk round the old fort, and even take a boat trip up the river. St Emilion is world famous and just one hours drive away. It is a lovely place to visit and has a tourist train that will take you around the town. Have lunch at the Bell Tower and then go to sample the wines at the many Chateaux surrounding St Emilion. Christmas at Chez les Rois: There are a host of things to do during the Christmas and New Year period. Visit Bordeaux At Christmas the city is magic to see.All the major streets are decorated but when darkness falls the Christmas lights are amazing. Take time to visit the “Marche de Noel where over a hundred log cabins form a“Village Epinal”. A magical atmosphere where you can discover gourmet food, Christmas decorations, perfume, toys jewellery, pieces of art and much more.There is a huge carousel and ice skating at the side of the river.Other things to see and do over the festive period….The Chocolate Factory at Angouleme,You can go on a one hour course to create your own cholates.The cognac/pineau tour at Martell,Courvoisore,Camu or experience a local tour at a producer only 800m away from Chez les Rois. You can pick your own mistletoe on the way back! St Emilion- a lovely place to visit at any time of the year but very pretty to see at Christmas and don't forget to visit the chateaux for your wine!! Party at New Year!: . New Year in France is perhaps the culinary high point of the season when after the Christmas festivities friends and family get together to celebrate with a feast called 'le Réveillion de Saint Sylvestre'. Celebrate with oysters, foie gras, lobsters, magret, chocolates and not forgetting the champagne. We have a huge dining room were you can host the celebrations and even throw your own party afterwards.To see what's included in the festivities over Christmas and New Year check out the notes to the rental rates. During the Christmas and New Year period the Farmhouse and the Barn will be decorated for your arrival. The Chais lounge/dining area is very large and can seat 18/40 people. We have Christmas decorations and Christmas trees in most reception rooms but there is a huge Christmas tree over 4metres tall in the Chais lounge /dining room. It's a great place to enjoy Christmas or New Year and if you so wish, relax and we will organise the catering for you. All bathrooms are supplied with towels,facecloths and darling toiletries for your use. WE have four lounge areas that seat 25 people. This pool is completely private and for sole use. We have access to clean the pool only. The main pool is for the use of guests and the owner Gail. Outdoor Facilities & gardens, 2 superb pool areas with sun loungers, parasols, BBQ's & dining facilities for 22 people. The French windows from the 'Chais' in the Farmhouse lead directly to the pool area. The pool is 9x5 with Roman steps & surrounded by a Mediterranean garden with hibiscus, cannas, olive trees, flowering laurels & yuccas. Adjacent to the pool is a large sunbathing terrace with sun loungers & parasols. Part of the pool area is split level with a large gazebo, which affords you the comfort of dining 'al fresco' in the heat of the day. The second pool/ the communal pool is accessed from the balcony from the lounge in the Barn or by a gate in the courtyard. This is a large pool area with sun loungers, parasols, outdoor dining facilities,summer kitchen & BBQ. The pool has roman steps & has a jet stream so that you can swim against the current. You can join us for a drink round by the pool or try or Paella Soirée. Our stay at Chez Les Rois was lovely. Our room was clean and tidy, the customer service we received from the owner was top notch. We were attending a wedding and the day couldn’t have been any better, was perfectly organised and executed well. We will definitely stay again, and I will 100% be recommending to friends and family. We have stayed at this property 3 times and have already booked again for this year. The property is beautiful and has everything you need for a relaxing holiday. The ensuite bathrooms have recently been refurbished and add a modern touch to the traditional buildings. Gail is always very welcoming and will advise you on local restaurants and places to visit. I would highly recommend this property to anyone as I know they won't be disappointed. Great Home away form Home and wonderful hosts! Every year, our company go on a 4 day away weekend to take time out and also team build. We have been to Berlin, Ibiza, Majorca, Tuscanny, Croatia - to name a few and Bordeaux was next on the list. So, we have built up quite a resume of group/company travel and the expectations have gone higher and higher by the year. This year I arranged a Bordeaux holiday for the staff away weekend - there were 27 of us looking for a break from London and a place that could accommodate us for 4 days, make us feel comfortable and spoilt, but also a place where we could be left to our own devices - and that's exactly all what we got! Chez le Rois is tucked nicely away from everything - in a good way. Its a very comfortable, clean and well maintained residence suitable for all ages! Kids (big and small) will be very well looked after with outdoor games equipment and a big TV on any rainy day. The swimming pools are a lot of fun, as are the sun lounges if you're an avid tanner. The kitchen is really big and spacious so self catering is very easy in terms of having many people in one space cooking up a storm, which is what we did when Gail did not prepare us fantastic dinners. Gail cooked us 2 very special 4 course meals that were simply divine!! And we are all very fussy diners too, so 5 stars to Gail. Gail and her team are the perfect hosts - they let you get on with your business but also very helpful if need be and they don't sweat the small stuff, nothing is too big a problem and they have a great attitude that all can be achieved (within reason of course). I could honestly not fault Gail and the residence! Would love to revisit, if Gail would have us back! Fantastic holiday with wonderful hosts. Gail and Mike were fabulous hosts - nothing was too much trouble and we loved the tranquility of Chez les Rois. The house is very well equipped and it was easy to cater for 21 with the size of the kitchen. Our children loved the grounds and still talk about picking Gail and Mike's tomartoes! We felt that the parties staying in the farmhouse especially the 2 master bedrooms should pay a larger percentage of the rental costs. We would love to come back and enjoy more of the Charante and Chez les Rois. Thank you Gail and Mike. Myself & my wife love southern France and decided to get married; using Chez les Rois as our venue. From the planning to the execution on the day Gail and her team were priceless; I can safely say the day would not have gone ahead without her support. She was invaluable on the ground in terms of local red tape and dealing with the various authorities. Her list of local contacts is extensive and we had choices for every service we required. We had over 100 guests travel to the area; all accomodation was sourced and checked by Gail and her team; our guests were stunned by both the quality and price of their accomdation and could not have been more complimentary. We used the venue for 3 days of events with the wedding being held on the Saturday. The attention to every little detail was outstanding and the venue on each day was stunning. The staff on all days were great with a real sense of humour and service was at the centre of every element of the day. We have been inundated with our friends compliments since our return. The "best wedding ever" being the uniform description. I cannot recommend the venue more highly; we had the perfect day and a wonderful start to married life. 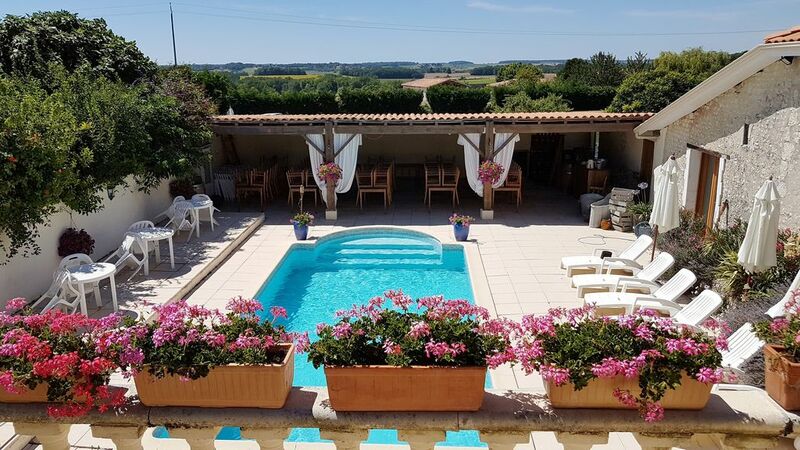 My only regret is you can only get married the "once"
Chez les Rois is situated in the quaint picturesque village of Berneuil. The boulangerie is a two minute drive away by car,or meander through the sunflower and vine fields for your morning croissants. You can find the grocers, chemist, bank and post office at 8 kms and for major shopping Barbezieux is a ten minute drive away.We also have a lake nearby, at Brossac, where you can hire bikes. It's a wonderful setting,they have a snack bar and a restaurant.Near the beach area they have lots of activities for the children to do over the summer period,should they get bored of the pool at Chez les Rois. Berneuil is located in the Charente, SW France.We are 50 minutes from Bordeaux Airport and one hour away from the coast. All the major Airlines fly into Bordeaux. BMI Baby?Ryan Air and EasyJet operate out of the majority of UK airports and offer inexpensive flights to Bordeaux, Limoges, Poitiers, La Rochelle, Bergerac and Limoges.